$500,000. 2 IT Directors. 1 Major Upgrade. A new technology infrastructure at Education First gives the small shop the tools to rival much larger competitors. Mike Wettrich is a former state regulator with years of experience examining shops across the Buckeye State. That’s how he knew soon after he arrived as CEO at Education First Credit Union ($98.3M, Westerville, OH) in August 2014 that something wasn’t quite right with the technology at his new cooperative. So, Wettrich brought in a new IT chief well-versed in the Symitar core platform that Education First uses. Unfortunately, the challenge proved too much for that technologist, who left within his first week at Education First. Next, Wettrich brought in Chris Burd, a headhunter’s find with nearly two decades of enterprise infrastructure experience at major vendors and a large bank. The duo soon discovered Education First’s network was hopelessly outdated, out of compliance, insecure, and near complete collapse. Education First director of information technology Chris Burd, left, and CEO Mike Wettrich chart the credit union’s infrastructure future. 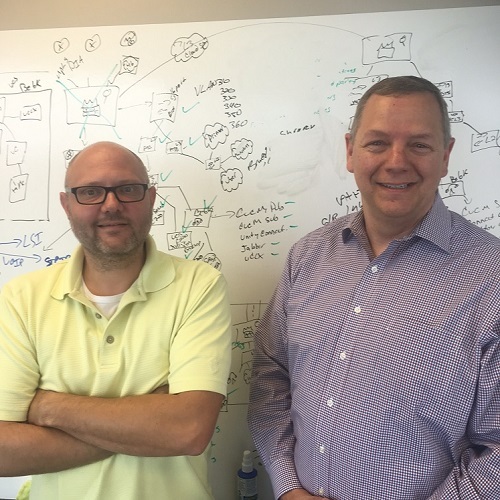 A half-million dollars and one year later, Education First now has a scalable, compliant, adaptable network that meets disaster recovery standards and enables the credit union to offer modern products and services in a more secure environment, according to Wettrich. And because no modern upgrade is complete without digital services, Education First now offers more of those, too. IT infrastructure needs to be able to respond to changes and function properly no matter who’s in charge. When Burd arrived at Education First in August 2016, he found a disparate mish-mash of legacy systems that not only didn’t communicate with one another, but also had not been updated or even patched in some cases for up to a decade. Burd devised a plan — short on time and long on expenses — that he took to his boss, who then took it to the credit union’s board of directors. Click here to see Burd’s presentation to the Education First board or directors. A half-million bucks is a lot to a credit union that brings in approximately $1.5 million in income a year, but Wettrich says he knew it had to be done, and it was worth doing right. Like what you’re reading? Learn more about Callahan’s Media Suite subscription, which gives you greater access to the content available on CreditUnions.com. A huge chunk of Education First’s investment was in equipment, as the credit union undertook what Burd refers to as a “forklift upgrade,” where new hardware came in by the pallet load. Then there was the software and connecting technologies. The gear went into existing operations and to a new co-location site that has greatly enhanced business continuity assurance. The blend of Citrix Systems, Citrix, and Microsoft solutions is driving a cloud-based network that now updates and patches on its own as much as possible, keeping manual intervention to a minimum while adding new efficiencies, including saving some serious dough on vendor contracts. It’s all up-to-date and designed to stay that way, with best practice management that keeps the system under control no matter who’s overseeing it. I think the lesson here is to not fear the cost of technology. Kicking the can down the road and waiting until it’s too late could be a disaster. Part of Burd’s goal of creating a microcosm of the big bank environment from whence he came included exacting that same kind of discipline on vendor relationships, including pricing. For example, the credit union’s negotiations reduced the price tag for new equipment from $780,000 to $370,000, and Education First is saving another $4,900 a month through new deals struck with existing vendors. But there’s a double bottom line here. Education First spent money to save money — increasing operational efficiencies and improving product lineup along the way. At the same time, it is now operating more safely than ever.